Another photo from our trip to the Milwaukee Public Museum. The museum has a number of life-size displays of various scenes, and this scene is one of the favorites. 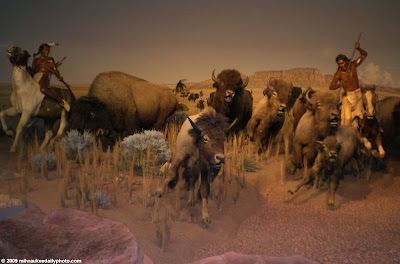 The looks on the faces of the buffalo are so realistic, and the size of the display is really impressive. In addition, there is a rattlesnake off to one side that has a remote control switch, and the kids (and grownups) that know about it like to set off the rattle. I'd love to see this up close. We sure did screw over our American Indians buy killing off the buffalo.